A blogroll is a list, sometimes categorized, of links to webpages the author of a blog finds worthwhile or interesting. The links in a blogroll are usually to other blogs with similar interests. 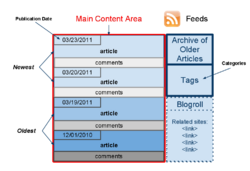 The blogroll is often in a "sidebar" on the page or featured as a dedicated separate web page. WordPress has a built-in Link Manager so users do not have to depend on a third party for creating and managing their blogroll. Once enabled, trackbacks and pingbacks from other sites will appear in your Administration Panels just like other comments, but on your post pages, they will appear according to your theme's design. Once enabled, pingbacks are sent automatically when you publish your post, you don't have to do anything. To send trackbacks, you will need to find the trackback URL somewhere on the post page you are linking to. If you can't find one, try to determine if the site supports pingbacks. If it does, you should not send trackbacks as well. Copy/paste the trackback URL into the Send Trackbacksfield on your Add New Post screen. If you don't see this field, go to the screen options and select the Send Trackbacks option. Note that selecting this does not send trackbacks, it only displays the field called Send Trackbacks. When you publish your post, trackbacks will be sent to the URLs you pasted into the field. This field will also show the status of trackbacks and pingbacks on your Edit Post screen. If there is someone that wants to send a trackback to your WordPress blog because their blogging software does not support pingbacks, your trackback URL they should insert into their post edit panel is your blog post's permalink with "trackback/" appended to the end. If their software supports pingbacks, they do not need to do anything, the process is automatic. One can easily guess that the Permalink includes the date of the posting, and the title, just by looking at the URL. One might also guess that hacking the URL to be /archives/2003/05/ would get a list of all the postings from May of 2003. Pretty (cool). For more information on possible Permalink patterns in WordPress, see Using Permalinks. Excerpts are condensed summaries of your blog posts, with blogging tools being able to handle these in various ways. In WordPress,Excerpts can be specifically written to summarize the post, or generated automatically by using the first few paragraphs of a post or using the post up to a specific point, assigned by you. WordPress offers simple and easy ways of adding Plugins to your blog. From the Administraton Panel, there is a Plugin Page. Once you have uploaded a Plugin to your WordPress plugin directory, activate it from the Plugins Management SubPanel, and sit back and watch your Plugin work. Not all Plugins are so easily installed, but WordPress Plugin authors and developers make the process as easy as possible. For more in-depth knowledge please visit http://firstsiteguide.com - you will find advanced tutorials on WordPress.